tammy's blog: An unexpected visitor!!! We named him "Bruno". 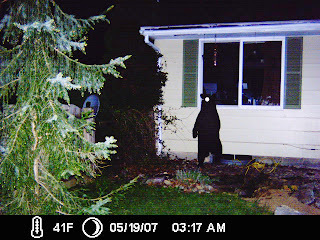 Although we have not actually seen this black bear, we have seen evidence of him such as bird feeders torn down and our grill tipped over. 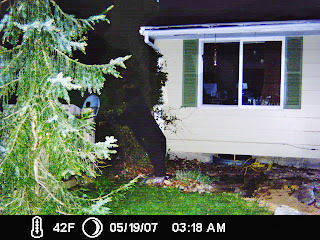 So we decided to set up the "deer cam" which is a motion sensor camera w/ a flash that photographs just about anything that moves day or night. Lo and behold we caught him on camera!!! As you can see by the time stamp, he was here in the middle of the night. I guess this is one of the things we can expect now that we live on top of a mountain surrounded by state game land. We are actually pretty excited about Bruno and we hope to catch a glimpse of him with our own eyes......maybe not up close and personal, but from a safe distance. It's not every day a person has to clean bear paw prints off their window! That is the very window where my desk sits that I work at every day. We estimate that he is about 5'6" tall. Apparently the flash from the camera scared him away and we haven't seen him since. We heard the other day that a bear was hit by a car about a mile from our house. Unfortunately it may be our Bruno. I'm sure there are more bears around here, but it may be a while before we get another chance to see or photograph one.